URI stands for Uniform Resource Identifier. URI is a text which is used to identify any resource or name on Internet. 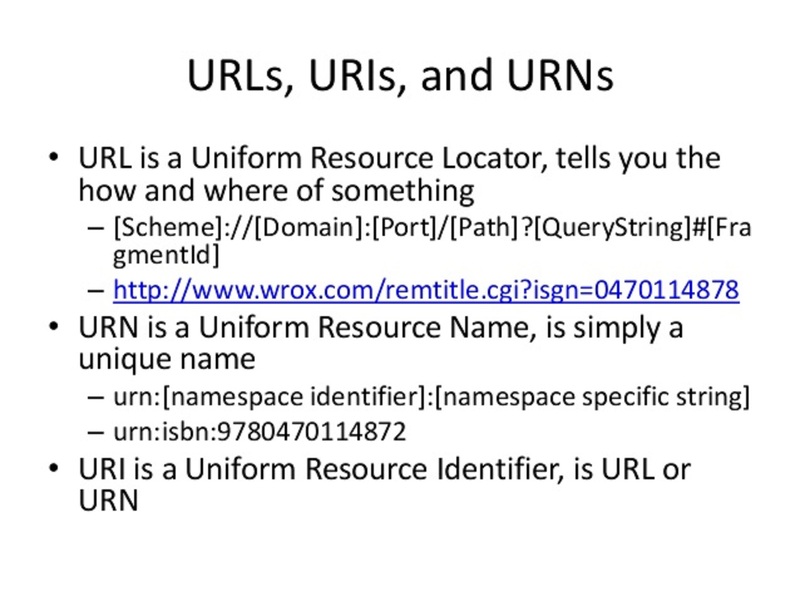 URI has two specializations in the form of URL (Uniform Resource Locator) and URN (Uniform Resource Name) to identify resource and name. We mostly see examples of URL and URN in the real word. If you are working on JSP and familiar with using tag library e.g. display tag and JSTL core tag library, then you may remember the use of URI to locate binary corresponding to a tag library. 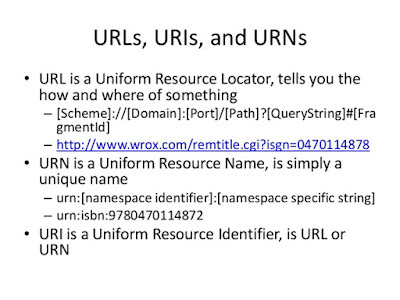 URL standards for Uniform resource locator and it is a subset of URI or Uniform Resource Identifier. URL includes location as well as the protocol to retrieve the resource e.g. in http://java67.blogspot.sg/2012/09/what-is-new-in-java-7-top-5-jdk-7.html, HTTP is a protocol which can be used to retrieve resource what-is-new-in-java-7-top-5-jdk-7.html available in location http://java67.blogspot.com directory. It's not necessary that URL always include HTTP as protocol, it can use any protocol e.g. ftp://, https:// or ldap://. URN stands for Uniform Resource Name. URN is also the subset of URI. One of the best examples of URN is ISBN number which is used to uniquely identify a book. URN is completely different than URL as it doesn't include any protocol. 1) Every URL and URN is URI because URI is the superset of both URL and URN. 2) URL includes protocol e.g. http://, ftp:// along with location to identify resource e.g. http://www.blogspot.com/abc.html. 3) URN are the unambiguous way to identify a resource. ISBN numbers are best examples of URN. 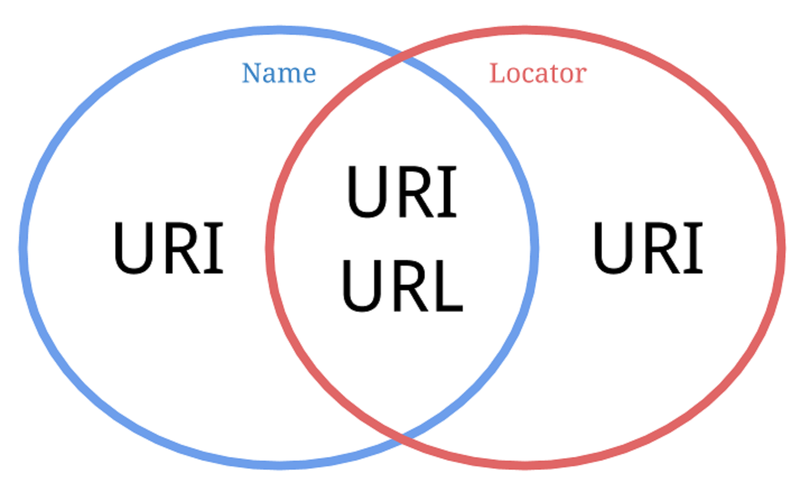 That's all on the difference between URI, URL, and URN. It’s good to know how much difference they are though you mostly need to deal with URL. I am still not clear about URN. Can you please confirm me, according to RFC 3986 is ":" (colon) is reserved character for URN ? You seem to have changed your closing diagram from what it was when this article was first posted (as seen here) ... and now it's incorrect. I think you've also changed some content (or possibly I didn't read closely enough the first time), as it's also incorrect. In your first paragraph, "the main difference between URL and URI is protocol," "URI" should be "URN" -- but this is not accurate. For a URL, the scheme (the part before the first colon, ":") is also a retrieval protocol; for URN, the scheme *may* be -- but is not necessarily -- a retrieval protocol. Later, in "What is URN?" you say "URN is completely different than URL as it doesn't include any protocol." As above, this is not accurate. URN scheme *may* not be a retrieval protocol -- but when a URI is both a URL *and* a URN, the scheme *is* a retrieval protocol. Left ellipse == URN (Name). Right ellipse == URL (Locator). Intersection == URN *and* URL. some (but not all) URNs are also URLs. 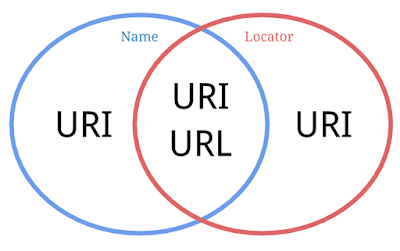 some (but not all) URIs are both URLs and URNs.